Broad multi-colored stripes combined with an intricately patterned background give a touch of intelligence to this rug. Woven with double warp for extra durability and design emphasis. 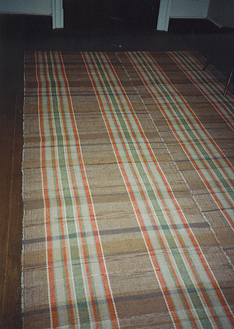 Floor coverings in early American homes included a variety of flat-woven carpets - among them the familiar rag carpet. Strips of fabric carefully cut from household textiles too worn for other use were sewn together and wound into balls. This material was recycled into rugs on the home loom or perhaps by an itinerant rug weaver. To recreate the antique quality we use a finer weaving scale of 5 to 6 rows per inch and choose cloth typical of the era, sometimes over-dyeing or bleaching fabrics to approximate aging. Weaver's Choice Wool is a selection of favorite rugs that we have perfected over the years. Woven of resilient and long-wearing wool fabric strips and cotton warp, these rugs feel great underfoot. All Weaver's Choice Wool rugs are washable except for "Keeneland". Care instructions are included with each rug. Alternate rows of thick wool and thin yarn in a widely-spaced warp produce a wonderfully textured, plush wool rug. 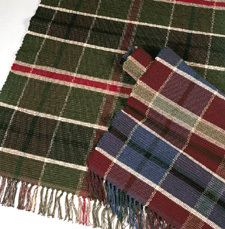 Liven up your room with one of these handsome plaids from Kentucky's horse country.